Mix whole wheat flour, yeast, salt and sugar in a mixer bowl. Combine cottage cheese, water and oil; heat to very warm, between 120° to 130°F. Add to flour mixture along with the egg. Beat for 3 minutes on medium speed. Add 1/2 cup all-purpose flour; beat 1 minute. Gradually add enough remaining all-purpose flour to form a soft dough. Turn out onto a lightly floured surface and knead for 6 to 8 minutes, until dough is smooth and elastic. Cover and let dough rest for 10 minutes. Roll dough into a 12 x 10-inch rectangle. Cut twelve 1-inch strips (each 10 inches in length). 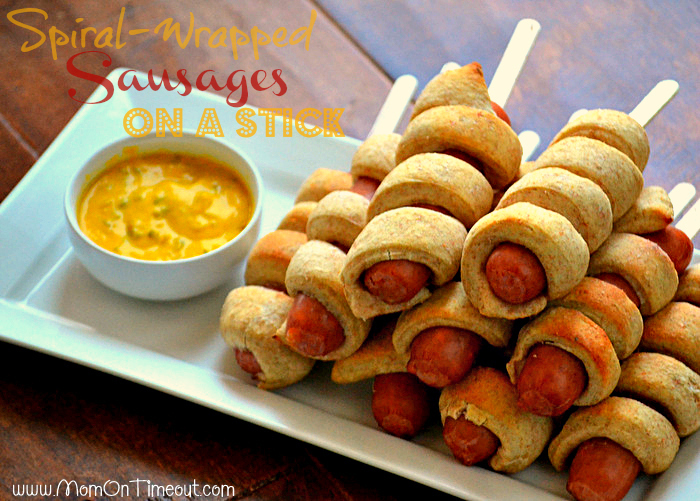 Wrap a strip around each sausage, tucking ends under sausage. Place on a parchment-lined or greased baking sheet. Cover and let rise 20 minutes, until puffy (dough will not double). Place in preheated 350°F oven and bake for 15 to 20 minutes until golden brown. Remove and insert stick in one end. Serve immediately with dipping sauce. Dipping Sauce: Combine mustard and relish in a small bowl. Recipe Tip: These can be frozen after baking. To do, simply wrap tightly in foil, then freeze for up to 3 weeks. Thaw in refrigerator, then either heat in 350° oven for 10 to 15 minutes, until heated through OR place Polish dog(s) on a plate and microwave about 45 seconds per dog until heated.